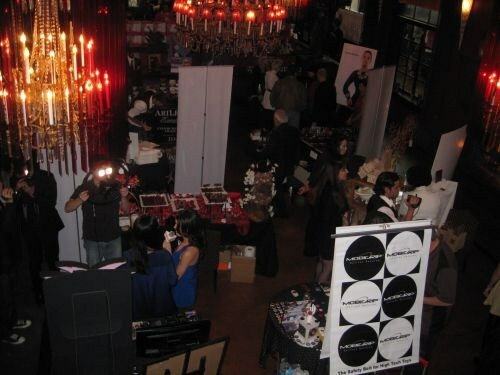 Both levels of West Hollywood, Calif.’s Café La Bohème were filled with celebrities, the media, and giveaways of beauty, fashion, and other items. In anticipation of the Oscars, celebrities attended The Second Annual Valentine Romance “Sneak Peak” Oscar Suite hosted by restaurant Café La Bohème and watchmaker Jorg Gray and presented by skin care company CellCeuticals. These “gifting suites” are a marketing tool for manufacturers to get their products into celebrities’ hands. Vivian Valenty, president of VB Cosmetics, was at the event with 36 of the 75 colors that are part of the Dazzle Dry polish line. “This is my first time participating in an event like this. I wanted to get some pictures of celebrities with Dazzle Dry products,” Valenty said. I snapped this picture of Dazzle Dry’s Vivian Valenty with actor Gilles Marini, as she handed him some of the company’s nail products. Dimitri James of Skinn Cosmetics was giving away his “Face in a Case” make-up collection and talking about beauty trends he’s noticed recently. “Short natural nails with dark colors are in,” he said, saying he keeps seeing Butter London’s British Racing Green polish showing up everywhere. Other beauty and fashion companies that sponsored the event included Herban Body Care, RisQuè by Mai Lieu, FreeBeneath, and SpinGym.